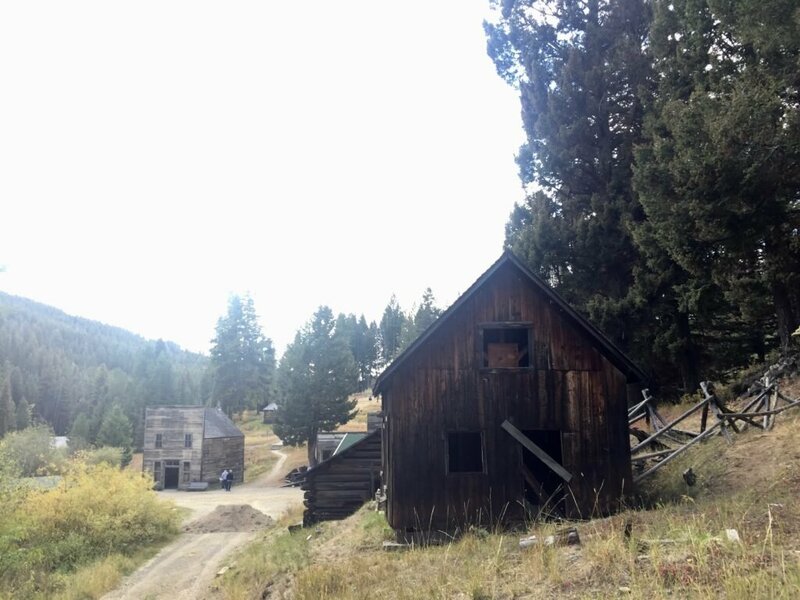 The abandoned mining town of Garnet, Montana is located about eleven miles up Garnet Range Road between the towns of Clearwater and Drummond in the Missoula area of Western Montana. 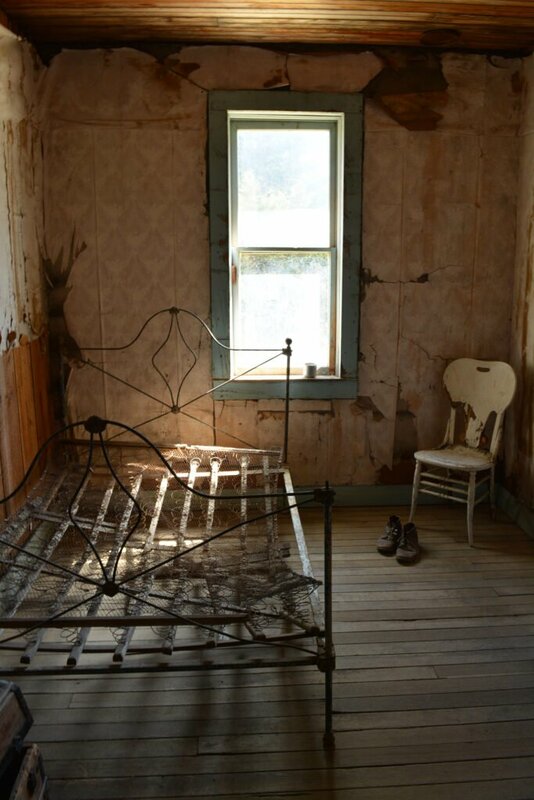 In its heyday, the town swelled to nearly 1,000 people in 1898, only to be virtually abandoned just seven years later. The town remains nearly pristinely preserved as it was over a century ago with fully intact and furnished buildings. A day visit to the town is well worth your time to find a sense of Montana’s past without commercialization. Garnet is listed on the National Register of Historic Places, including 82 buildings, 46 structures, and dozens of historic sites. The Bureau of Land Management and the Garnet Preservation Association (a non-profit citizens group) maintain and manage the site now. Visitors will find a visitor’s center and self-guided trails with interpretive signs to learn about the town and the buildings. The main part of town was built on the Garnet Lode mining claim. Although the town never had a bonanza strike, there were about fifty mines in the area. Placer gold was first found in First Chance Creek in 1865, mostly recovered by drift diggings. Dr. Armistead Mitchell built a processing mill at the head of the creek and soon the townsite of what became Garnet was subsequently developed around the mill. The mother lode, containing three source veins and pockets of rich ore, was discovered in 1867. A major gold strike at the Nancy Hanks Mine in 1898 lead to the boom of the town of Garnet, bringing stores, hotels, saloons, a school, barbershops, and even a doctor’s office. The Nancy Hanks Mine was the most profitable mine in the area, producing gold, copper, and silver until 1954. The town was nearly abandoned by 1940 as the gold deposits became scarce, and a fire in 1912 destroyed many of the commercial buildings. As World War II approached, the population of the town dwindled and eventually the town was left to the elements and vandals. Restoration work at the site began in the 1970s. To date, over 30 buildings have been historically preserved at the site, including the JR Wells Hotel and Kelly’s Bar (Garnet was well known for its bars and saloons at its peak). Visitors can walk through town and into multiple buildings. Several hiking trails allow you to experience different aspects of the area, from the trek to scenic Warren Park to the mine operations of the Sierra and Forest Lode Claims. The road into Garnet is not recommended for trailers or RVs, and no camping is allowed within a ½ mile of the Garnet townsite. However, there is dispersed BLM land camping available in the area. Established campgrounds can be found in the town of Drummond and near Missoula as well. You can learn more about Garnet on their website. Interesting, may plan a trip to see. Thanks for sharing…. Garnet is a beautiful place to visit, with crystal clear skies, wild flowers and amazing views.. My wife and I volunteer at Garnet from May to September and live on site. There are two roads leading to Garnet, the first is located off MT 200, at MP 29. Garnet Range Rd runs from MT 200, 11 miles to Garnet. The first three to four miles are paved, then the road becomes gravel. Garnet Range Rd is two-laned, and as the summer wears on the road becomes rough but is passable with any low profile vehicle. There is a little treasure as you drive the Garnet Range Rd, about six miles from MT 200, you will pass another Ghost Town, Colomia. Colomia was a sister town to Garnet. The second road to Garnet can be found off Interstate 90, and Bear Gultch Road. The road is single lane, dirt and is not maintained. Passenger vehicles can make the trip, but drivers and passengers not accustomed to steep drop-offs, switchbacks and large mine vehicles should avoid the road. No trailers or RVs should make the drive.. The scenery is breathtaking and wildlife is often seen in the area. If you make the drive, you will not be disappointed. Make sure to stop by the visitors center and say hello and meet our BLM Rangers and Bark Ranger Charlotte. We do offer at no charge, guided tours and with the purchase of pay dirt from a local gold mine panning instructions. We love being in Garnet, so will you! When I lived in Idaho I was often disappointed visiting the numerous ghost towns of thousands of people. Most were nothing but foundations. The towns were all built of wood. Shingles were the common roof material. In the building business wood shingles are known as kindling! Most towns eventually burned down. We are planning a visit in 2021. You will not be disappointed. 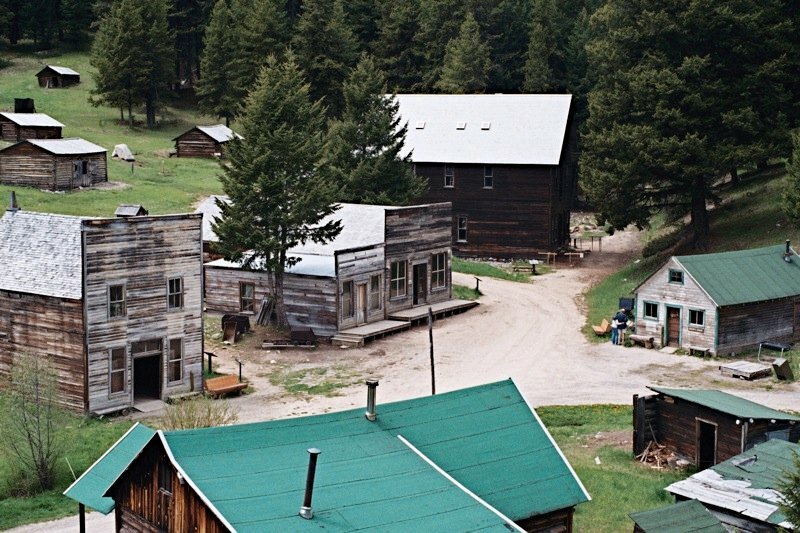 Unlike other Ghost Towns, every building is original to the site., and the location where it stands. Nothing has been moved to Garnet to create the town or the illusion of a town. All of the artifacts were found in or near the town. With over 30 buildings to explore, not to mention the near by mines, trails and a remote park, expect to spend most of the day. And if you visit In August, bring something to pick huckleberries, raspberries gooseberries and other wild berries. Best ghost town I ever visited. Scenic drive with vistas from the mountain road leading to Garnet. Just go slow on the gravel road portion. You will not be disappointed. Also, if you are near Missoula, don’t miss the little town of Hamilton in the beautiful Bitterroot Valley (it’s not a ghost town). If you want to camp near Missoula, stay at Jim and Mary’s.